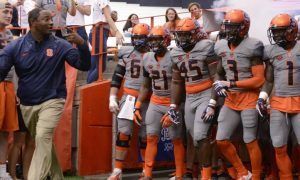 With Syracuse football on its bye week and coming off two losses, attention has quickly turned from the gridiron to the hardwood for SU fans. 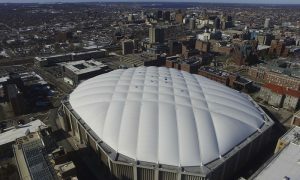 The Orange’s first scrimmage of the season is less than two weeks away when they take on The College of St. Rose in the Dome on October 25th, but another significant date is quickly approaching. 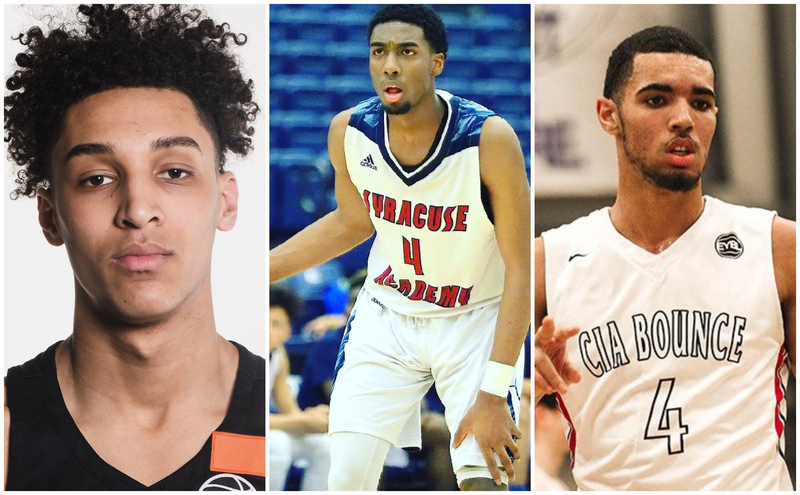 The most prolific scorer in New York state basketball history, Joe Girard III, is set to make his decision this Sunday in his hometown of Glens Falls, NY and SU’s offer is one of six that the combo guard is still considering. 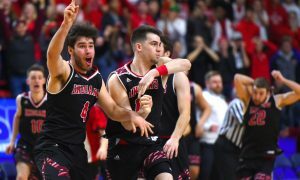 Even though Girard checks in as just a three-star recruit according to 247 Sports, he’s still the guy that averaged 50 (yes, that’s not a typo) points per game last season and is considered one of the top three-point shooters in the class of 2019. 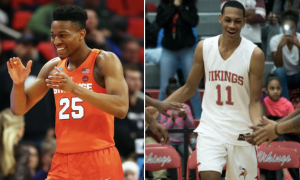 When you couple that kind of scoring ability with the fact that he’s an in-state phenom and only lives about three hours away from SU, you get a guy that Syracuse fans are begging to wind up in Orange and White. 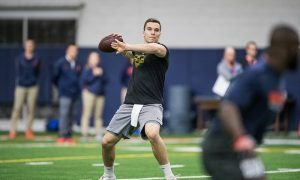 People are actually going nuts for Girard to come to SU. But, what if he doesn’t? 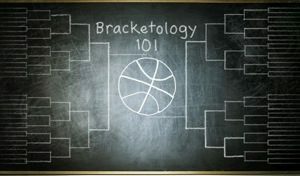 There are still five other teams that he’s considering and it’s not like SU basketball gets every kid that lives in the upstate area (just ask CBA grad Greg Paulus) so there’s still a chance that the Jimmer Fredette prodigy goes somewhere different for school. So what happens if that’s the case? 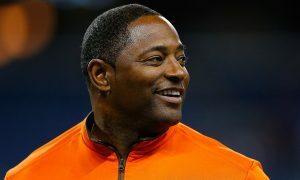 Who else can slot in as SU’s long-term option at shooting guard if he doesn’t end up picking the Orange? 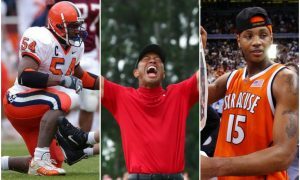 Luckily for SU there are more than a couple stellar options. 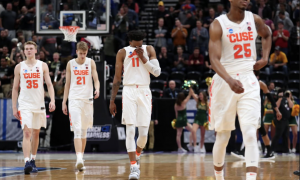 We can start the search for that long-term solution in the case that Girard doesn’t come to the 315 with somebody who has already made his decision to come and play for Jim Boeheim and company. 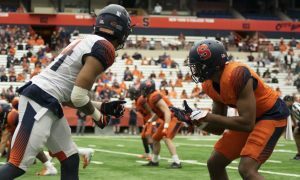 Goodine became the first commit in the Orange’s 2019 class when he pledged to SU back in September 2017 and since then he has skyrocketed up recruiting boards. Now considered a consensus four-star recruit, Goodine checks in as the 93rd best player in his class according to 247 Sports and the 69th best according to ESPN. 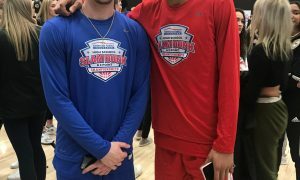 The shooting guard out of St. Andrew’s School in Rhode Island is coming off a junior season (4th year of high school after missing freshman year with an ACL tear) in which he averaged 21.1 points per game to go along with 6.5 rebounds and 5 assists per contest. Those fantastic numbers made him the Rhode Island Gatorade Player of the Year as well as USA Today’s state player of the year. Known for his explosive athleticism and dunking ability, Goodine is also one of the purest shooters in his class, knocking down over 50% of his attempts from beyond the arc last season. If SU fans want Girard for his shooting ability, then they’re going to get that and more with Goodine. He’s more athletic and more explosive than Girard and he’s going to be an exciting player to watch next season. Because he committed over a year ago, it seems like Goodine sometimes gets lost in the shuffle, but he is an elite player that could easily slot in over Girard and is already on his way to the Hill. 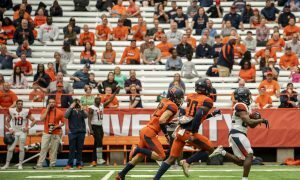 So with Girard’s shooting ability taken care of with Goodine, it’s time to turn our attention to the other reason SU fans have fallen so in love with JGIII: his proximity to Central New York. 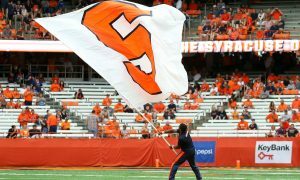 Glens Falls is about three hours away from Syracuse, but how about we go ahead and one-up that with 2020 combo guard Symir Torrence who actually grew up in the Salt City. 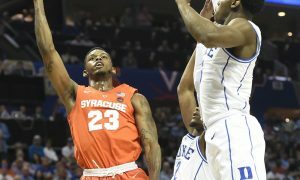 When he was going to school in CNY, Torrence played at Syracuse Academy of Science and was one of the best players in the area. He then moved on to Vermont Academy where he is set to begin his junior season in just a couple of weeks. 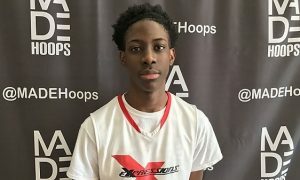 Another pretty good shooter (40% from three according to VT Academy head coach Alex Popp), Torrence’s best asset isn’t even on the offensive end. At 6-foot-3 and almost 200 pounds, Torrence brings a very physical skill set to the court and loves to play defense. 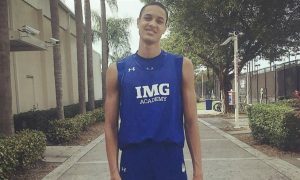 He’d fit in perfectly at the top of the zone and brings more physicality and size to the court than Girard (6-foot-1, 178 pounds) does. 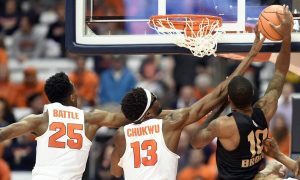 Syracuse is a team that prides itself on defense and that D works best when there is size at the guard position like they had with Frank Howard and Tyus Battle last year. 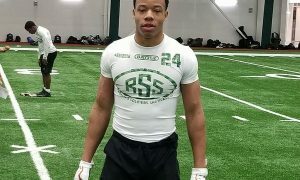 Torrence can bring that to his hometown team in the fall of 2020, making him a priority target that would be a fantastic fit if Girard decides to go elsewhere on Sunday. 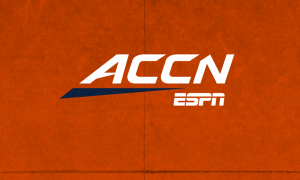 This may be getting ahead of ourselves considering the fact that Addison Patterson is rated as a five-star recruit by 247 Sports (#24 overall) and one of the two highest ranked four-stars by ESPN (#25 overall). 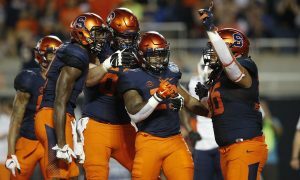 That kind of star potential plus the fact that SU hasn’t gotten a five-star recruit since Chris McCullough in 2014 makes Patterson a bit more of a wish list item but imagine how great SU could be if he did decide to come to CNY. 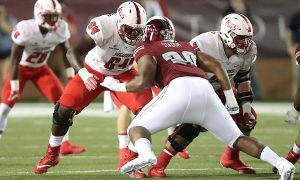 If you want to take about great size at the guard position, Patterson has exactly that. At 6-foot-6, the Canadian has elite length and athleticism for a two-guard. He’s excellent off-the dribble and can easily use his size advantage to get by smaller defenders while also finishing well at the rim when he gets in near the trees. His three-point shot is developing and will get a lot better with some more time. He’s also a great passer and has excellent vision in the open floor. 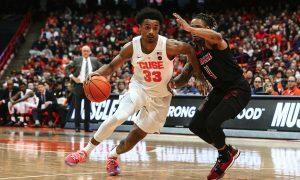 In some ways his skill set feels like a cross between what Lonzo Ball was at UCLA and what Oshae Brissett has been for Syracuse (this might also be because they’re both Canadian). 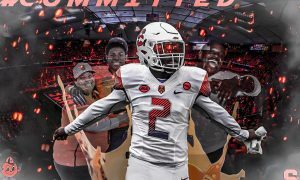 If you can get even just part of what Lonzo was or what Oshae is, then Patterson is in a great spot to be something special and would be an even better addition to the Syracuse program than Girard.